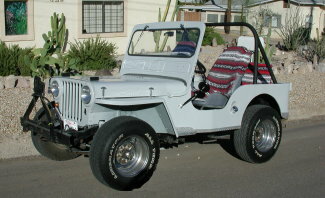 "My dad had owned a 43 willys jeep and that is what I drove during high school. It was a war jeep and had several bullett holes in it. 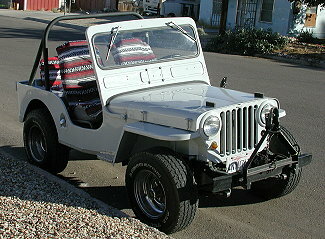 The pictures in your webpage bring back alot of memories and different thoughts about the jeep that I had forgotten. I just purchased this jeep on Friday, July 20th and drove it to my mech first thing. My mech knowledge leaves alot to be desired and I wanted it looked over to see where I stand. I paid $2200. for it and wasn't sure if I got took or not. This jeep has 2 gas tanks one under each front seat. The previous owner put in a different steering colum and it takes up alot of room. The seats are also very large so there is not much room to move around. "These are pictures of my jeep after getting the tiger top on. I'm really happy with the way it turned out. 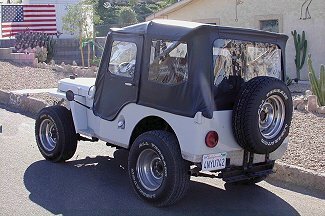 I'm going to have to make a modification on the rear because the spare tire blocks me from being able to snap the top down in back. I will need to have it cut and sewed to make it work. My wife keeps telling me it's a work in progress. painting but it didn't happen. I will learn to live with it. My wife and I are looking forward to going out and having some fun. I'll probably head towards Mitchell Caverns off I-40 around Essex. That about 50 miles from here or at least the turn off is. I will be traveling on National Trail Hwy Old route 66 just taking my time."